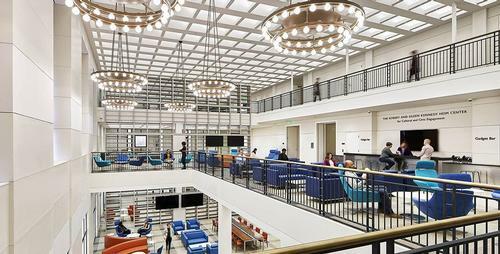 Following years of planning and renovation, the Free Library is set to open reimagined spaces in the Parkway Central Library later this month! The massive undertaking began with moving more than 800,000 books and materials, before deconstructing six levels of historic stacks. Three bold, new public spaces were created: The Robert and Eileen Kennedy Heim Center for Cultural and Civic Engagement, the Business Resource and Innovation Center (BRIC), and the Field Teen Center. Increasing the amount of public space from 35% (when renovations began in 2006) to 68%, the creative repurposing—conceived by the Free Library and designed by acclaimed Safdie Architects—of nearly 41,000 square feet of public and staff space is the largest renovation since Parkway Central was completed in 1927. The Free Library will celebrate with a grand opening for the public on Friday, April 12, which will include an unveiling of new work by Philadelphia-based artist Colette Fu, created exclusively for the Free Library, in partnership with the City of Philadelphia’s Percent for Art Program, which sits within Philadelphia’s Office of Arts, Culture and the Creative Economy. Fu’s series of four striking tunnel books—three-dimensional acrylic works inspired by traditional paper tunnel books—pay homage to the six stories of historic stacks that were dismantled in order to open up Parkway Central’s newest public spaces. Originally designed by Julian Abele, a prominent African American architect from Philadelphia, the Parkway Central Library receives more than one million visitors each year! Stay tuned to this blog throughout the week for spotlights on each new space, as well as a closer look at Colette Fu’s work! We hope you’ll join us to celebrate the new spaces at a series of fun public events beginning Friday, April 12, and including the 2019 Family Fest on Saturday, April 13! The building looks beautiful; and the technology is number one. So excited by this great new space. Writing group plans to meet there soon! Add a Comment to #ReimaginedFLP: Free Library to Open Reimagined Spaces in the Parkway Central Library!